Real-time is the future for data logger solutions. An intime report is valuable for decision makers during transportation. In this article, we are going to explain how a real-time data logger works to push data online. We are talking about wirless connection, nowadays we have WIFI, Bluetooth, Zigbee, RF etc etc, but they are all restricted by distance. Therefor in a typical cross border real-time data logger, cellular technoloy is used for data transmission, in particular, GSM. We build GSM moderm in every data logger, together with an embeded global sim card. Both the moderm standards and the sim card operator will decide the data connection coverage. Take Cydiance Lorca/Piura for example, the device enables a coverage of more than 160 countries, check the list here. Temperature, humidity data transmitting through cellular base station to online platform. You may well ask why do we not use 4G but 2G, a simple reason is 4G moderm is much more expensive than 2G, especially in our single use scenarios. There are also other cons with regards to 4G, we will write another article for this topic. 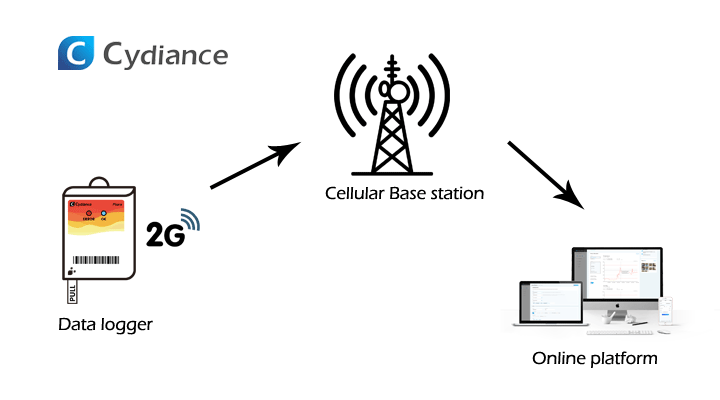 In this GSM model, the device will lose connection when there’s no base station around, for example travelling across oceans, this is a problem that basically can’t be solved. Unless we get a connection via satelite, but apparantly the cost is way too high. We will store all data sent by the device. In a later stage(it happens normally in several seconds) the system will proceed to data filtering, duplicates removing, etc., based on some complex algorithms. Refined data will then be presented on webpages. We encrypt all transferring data from the device and also exchanges between servers. We store data in both Alibaba and Amazon data center with enhanced security strategy to withstand external attacks. Author wangguanPosted on March 18, 2019 March 18, 2019 Categories StoriesTags Real-time data loggerLeave a comment on Real-time data logger – How do they work?